In the 80s glam scene, many bands were influenced by either Aerosmith or AC/DC. Kix took their inspiration from AC/DC and were one of the better bands to do so, probably because they spent so many years working the northeast bar circuit to hone their craft and actually were blue collar guys as opposed to the L.A. bands that mooched off their girlfriends for support until they “hit it big”. This album, their fourth release, was their biggest hit featuring the popular “Don’t Close Your Eyes” and “Cold Blood”. It eventually went platinum, but sadly, Kix never achieved the success they deserved. I think it may have been a case of having a hit so late in the run of the 80s glam scene that ANY momentum the band built with this album was gonna come to a complete halt soon anyway. This is a great and dare I say essential 80s rock release and everyone owes it to themselves to give at least one Kix album a try. 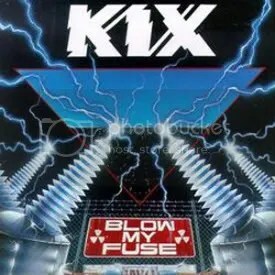 I’m kinda torn between my favorite Kix album being either this or Hot Wire (which featured “Tear Down the Walls”, one of my favorite power ballads). I picked this one up used in 1999 for $3.99, I believe. Not a scratch on it.